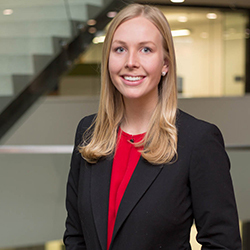 Madison Wempe is the Policy Research Associate for Friends of Cancer Research (Friends). Friends is an advocacy organization based in Washington, DC that drives collaboration among partners from every healthcare sector to power advances in science, policy, and regulation that speed life-saving treatments to patients. During the past 20 years, Friends has been instrumental in the creation and implementation of policies ensuring patients receive the best treatments in the fastest and safest way possible. At Friends, Madison focuses on researching, developing, and evaluating scientific and policy proposals to advance key Friends initiatives. Her work informs the dialogue between all sectors with which Friends collaborate and accelerates a more public understanding of pressing issues in cancer care. Madison joined Friends in 2017 as a Research and Advocacy Intern. Prior to joining Friends, Madison interned with the Botswana Ministry of Health and Wellness where she examined international health policies and evaluated their potential in Botswana. She has held various other internships in the D.C. area focusing on policy research. These organizations include Every Child Matters and Minority Whip Hoyer’s leadership office. Madison graduated from The George Washington University with a Bachelor of Science in Public Health.